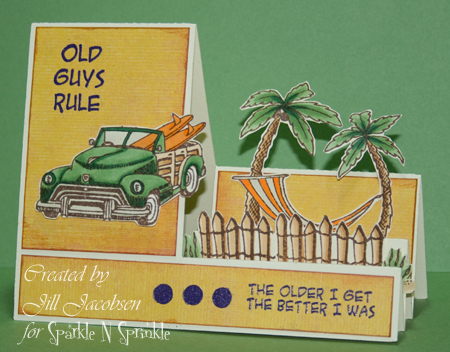 My brother in law had his 50th birthday today so I had to use the Surfin' Woody stamp set to make him feel good and old:) I didn't really care for the set at first, but know since I had use for the verses I find it quite fitting! 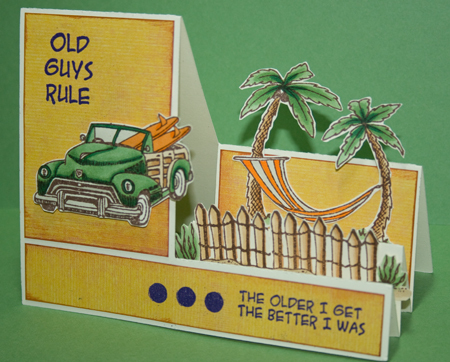 I used the Shades of Tuscany Concord embossing powder for the sentiments. I stamped all the images on Ivory Neenah and colored with Copics. Love this as a side-step card! Fabulous! Love it - it's perfect for the side step card! Another great Woody card. I see you got your favorite, green, in there and it looks fab. I have to agree that you have helped me to like this set with your cards. P.S. it was great to see you at Stampfest. Wow, Jill - these stamps look like they were made for this card! Great idea with the side step, and wonderful coloring! Super card Jill. Great way to use the step card to give the scenic look! Your coloring is awesome! My late hubby would have loved these stamps! He loved woodys and took me often to shows of these cars. He surfed in his younger days too! Good memories for me. Thanks.